It was nice to meet Paige at the start on Saturday morning. Like Kristyl and Chris the previous weekend she also got tired of listening to a couple of Fools natter away about their running. Unfortunately she didn't know the course, so had no choice but to stay with them to the end. Paige has aspirations to do a 100 mile race. Based on her speed and hill climbing ability she should do very well at that. It was nice to meet Krystil and Chris at the start on Saturday morning. They ran with John and Karl for a while, but got tired of listening to how great the Fools used to be and headed off on their own. There were only five starters at the 8 AM starting line. Notably missing was Rachel, who, in addition to Adrian and Karl, had intended to do the full 100 miles. That was very disappointing to the others who had planned to do the full distance and were looking forward to her company. The cold weather was almost perfect for running, although the occasional very light showers caused significant anxiety for the event host who remembered the near hypothermic experience of the 2009 Foolish Gerbil 100 Mile run. Fortunately nothing serious developed weather-wise. There were no takers for the 100 mile option. 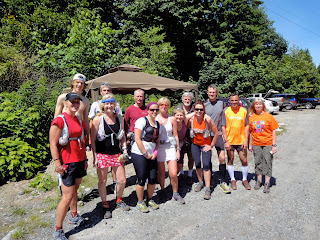 Five people with various goals were at the 7 AM start, with others starting at various times. The first loop was cloudy and cool, but the later loops were sunny and hot. A very light snowfall greeted a fairly large group at the 8 AM start. Temperatures were below freezing, but warmed up a bit during the day. The consensus seemed the be that the conditions were perfect. Very little ice was encountered along the course and the snow accumulation during the day did not significantly impact most participants. 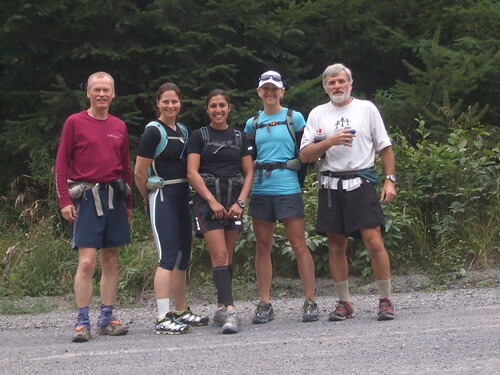 Only one casualty was reported: Liza, who started at Lynn Canyon, badly twisted her ankle and had to stop at Deep Cove. Only four fools toed the start line at 6 AM. Perhaps it was the inclement weather or that a few too many drams were consumed on Saturday night or perhaps some people simply decided to get off the wheel. Other than the charming company and witty conversation they didn't miss much. It was wet and cold. It may be time for a change of scenery.